In April 2010, Diiarts published Tulagi Hotel. I was thrilled to learn they wanted to hold a proper launch party in London, and I went there with much joy, as I knew I could now finally meet friends from Authonomy that I had known online for a couple of years. It was a great trip, but while I was there, the Eyafjallajökull volcano threw a tantrum, and all air traffic was halted. After a couple of days lingering in London, I decided to take the train back to Finland. I wrote this story on my phone as I was traveling. It was a memorable journey. When it became evident that the fireworks arranged in my honor by the Icelanders had gone somewhat over the top, I began to plan a quick getaway on Saturday, April 17th. By then I was one day over my original itinerary, but on the plus side was the fact I could attend the Havant Literary Festival, a quaint event with not too many attendants but all the more soul. Straight off the train from Havant, I went to a netcafe. Bookings for Eurostar were available for Monday morning, but only as far as Lille. Still, it was my only chance, what with Britain being an island and all. So I invested GBP159 in a ticket and was given a booking, which I collected on Sunday. 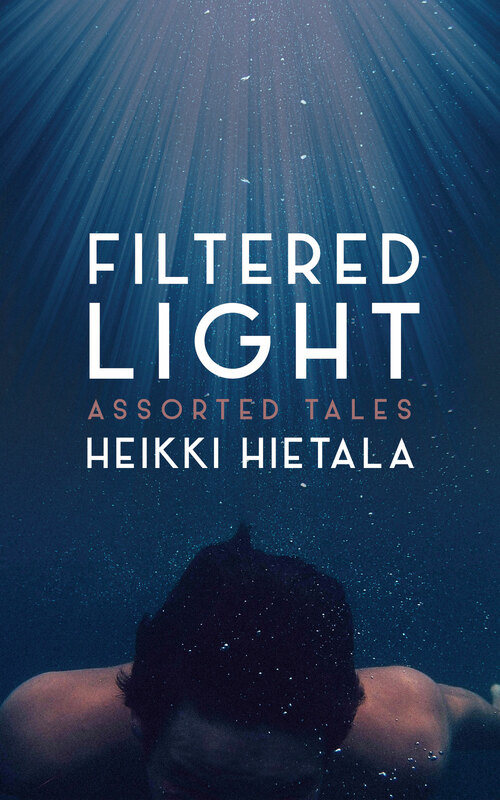 I also booked a night boat from Stockholm to Helsinki for Tuesday evening, because if the stars were correctly aligned, the connection was doable, I figured from online timetables. On Monday morning I booked a full train at St Pancras. It’s a nice train, and seeing the British countryside whipping by at 220kph would have been a treat, had the train not travelled within a walled enclosure for the most part. To make up for this lack of pretty views, we soldiered on at maybe 20kph inside the tunnel, and stopped for a good while to marvel at the solid construction thereof. At Lille I was told the train to Brussels was fully booked in 2nd class. Upon enquiring about 1st, the kind official told me that even if I could not place a booking using the ticket machine, or indeed get one from the ticket office, I could always wait an hour and a half, and discuss a seat in 1st class avec Monsieur le Train Conductor. I had never thought there is an intermediate state between a taken seat and a vacant one, but apparently there is at the French Rail. It must be a quantum seat. I checked the local trains, but found the Lille-Brussels stopped at every town with more than 20 inhabitants, and that there were a considerable number of such places. I would miss my only applicable Brussels-Cologne by a narrow margin of just 3 hours. Waiting was not an option now. Not to worry, I thought, this is why we have rental cars. I resolutely marched into the first of five which happened to be a Hertz. They happened to have a Belgian Ford Focus, and offered me a reduced price if I took it to Brussels. Nice touch, although I don’t see the deduction in the bill. Maybe they will give me one with the final Visa payment. The kind official also said there may or may not be a GPS installed. The lady had no paper maps over Belgium, however. In the car there was no GPS device. By chance, I had brought one with me, and as I sped out of the parking hall I triumphantly flipped it on. Seeing the red dot appear was ever so reassuring, but the fact I had maps for Germany and UK, but not Belgium, took something off the joy. The map download over the phone would have set me back 120 euros, so I did not do that. The dot was on a bland beige background, but it did show the national border in case I missed it driving through the customs. I found that when the gas pedal is liberally pressed, a Ford Focus with a diesel engine the size of a box of office paper will not go supersonic, but starts to wheeze at 165kph. That was enough to whip me to Brussels with time to spare. Still, the utter lack of signs for Bruxelles-Midi, or indeed any location inside Brussels, was a slight impediment. I stopped a tourist who was very kind and even gave me his map and pointed out my current location. His forefinger, however, went to an entirely erroneous part of town, so soon I was lost again, this time armed with a map though. I spotted two police officers, and learned I was still within the map but over to the other side. A straight road would take me to the Ring Road, and that went to the desired Gare. At the station, there was one sign for Hertz pointing left, but after that, nothing. I deduced it had to be inside the parking hall and found Hertz at level -4, after touring levels -1, -2, and -3 with just a bit more speed than allowable. I returned the keys somewhat hurriedly and sped to the ticket office. I was #6426 and the current queue was at #6210. I stopped a kind official who walked by; she knew that to queue was futile anyway as the train was full. She said the local trains to Leuven, Liege, and then Aachen in Germany would be the only option. Blessed with this data, I rushed out and bought a ticket to Leuven. I fit in that train and met a young Finnish couple, and we teamed up. Brussels-Leuven-Liege went fine, but the train broke down on the Belgian side of the border, and we were herded to two buses bound for Aachen. I was travelling light, with just one carry-on bag, but my teammates were not, so I took on one of their four sizeable suitcases. Cramming everything in, we managed to get seats in the bus. The bus made it to Aachen three minutes before the train to Cologne was to leave. But the Deutsche Bahn ticketing machine has an intuitive user interface and was a breeze to use (this I noted out of professional interest; I teach interface design) in 30 seconds flat. We boarded with a nice 8 seconds to spare. In Cologne we even had time for buying juice and sandwiches. And the Hamburg train had three seats, so we could even sit, unlike a few less fortunate accidental tourists. Apparently some people had invested in reserved seats, and every station caused a new round of Seat Bingo, and the procession of people looking for anything to sit on was incessant. My luck held, I did not lose the seat and could rest for the night ahead. I parted with the couple in Hamburg, and spent one out of the three hours I had to wait in a 24h netcafe. But one could smoke in there, and as I was the only one who didn’t, I had to take refuge at McDonalds. It occurred to me they sell food, and rarely has a Big Mac Meal tasted as good. The previous meals of the day, I reminded myself, were a thimble of coffee and a diminutive croissant in Lille, and the delicious baguette in the train. I met another Finnish couple and a Swedish engineer called Janne at Neumunster at 0018 on Tuesday when we all went looking for somewhere to stay until the next train at 0445. You see, even if the station was open and welcomed people for the layover, it was open at both ends and a freezing wind blew through it. A pub with three locals and the barmaid was still open. We asked when do they close, and the locals said, when they felt like it. So we rotated buying beer at intervals, and listened the locals play the jukebox, alternating between a yodel song, Waterloo, and some Julio Iglesianesque ballad with gypsy violins in it. Surreal is not the word to describe that place, complete with deer horns on the wall. At 0330 this Tuesday morning, the last of the locals passed out and we were ushered out to the street. A 24/7 deli was seen, and we bought token juice etc. so as not to be arrested for loitering. At 0430 the station announced a delay of 30 minutes for the train. This meant I would not meet the train that would allow me to catch the boat Stockholm – Helsinki, which was paid for. I still had one later connection I could use, if not only stars but galaxies would align in a fortuitous manner. This option dissolved by 0600 when we ground to a halt to admire a fine herd of very disinterested Frisian cows, or because of some other, more technical reason. When we fell 1h30 min late, the last means for meeting the ship evaporated. Oh well, I thought, all the more time to admire people sleeping on the floor of this overnight express, on which reservation was required, but could not be enforced with every nook and cranny harboring a fugitive. The worst sight was a 75-year old lady sleeping on the floor, because no one would huddle up just a bit tighter to find her a seat in the couchettes. I spent my time walking up and down the train and making conversation with strangers in the diner car to look like a customer. But as always, it was darkest just before dawn. As the Silja Line booking office opened, my wonderfully supportive spouse SMSed me their number in Sweden. I called them to book another trip, expecting my previous one lost without recompensation. The kind official suggested we convert the cabin on the night ship I could not possibly make for a day cruise at 0710 the next morning. Talk about a deus ex machina. And they gave me the price difference in their own Mickey Mouse currency to spend on the trip. I tried to kiss the official but only managed to make my mobile phone slippery. Again, my dear wife found me a hotel to call in Stockholm, and they did have one vacant room of the cheapest class. I would have settled for a doghouse, provided it was within the boundaries of Stockholm and preferably without a tenant for the night. I booked it and leaned back. Little did I now care that there was no direct train with seats between Copenhagen and Stockholm, or that I would queue for 1h45 minutes to hear they would not book me to Stockholm due to overload, but only across the bridge to Malmö, Sweden. The train trip to Stockholm was just about as Scandinavian as you’d expect, complete with seat handrests carved out birch. Many thanks to the designer for this pretty but uncomfortable vision. I didn’t walk the mile to the hotel, but took a taxi. Then I booked the train from Turku where the ship will land to Helsinki, and was sent the ticket as an image SMS. A quick meal, a hot shower, and a shave later I felt so much better already. And now I am 4 hours away from home. My 3 hour flight became a 62 hour multitasking dash. Many people have expressed their view that I will gain much material for writing; they are right. But I found I could not even take notes when the trip was most hectic. All my energy went into following the situation as it panned out and changed all the time, and the risk of being rolled if not mugged was real from Lille onwards. What I will do is see what my subconscious comes up with later on. 3) never underestimate the power of chance encounters. On this trip I was helped by many people of many nationalities and intents, and I was able to help a couple of people a bit. A bonus learning is to take the world as it comes and not believe one can affect that fact a single little bit. In September 2008, I received a very significant email from my friend Tim Wright. Well-connected as he is, he had received a beta-phase invitation to a new site being built by HarperCollins. This site, called Authonomy, was a new concept in book publishing: a site where authors could display their work and readers could then read new material for free. Books (or parts of books) that they liked could then be put on a virtual shelf, giving book points for the texts and reader points for the readers. 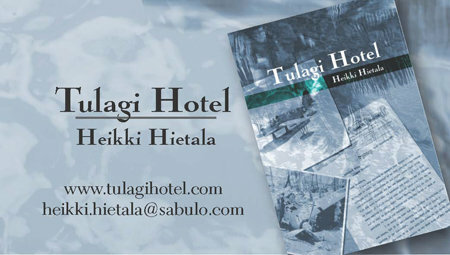 Tulagi Hotel is a novel of fiction. It has World War II as its background, and of all the different modes of warfare, it is set in the air arm of the US Marine Corps. This by default makes it necessary to have references to types of planes and guns and ships and whatnot, and there’s always the risk of alienating readers with technology. To offset the war, there’s a modicum of romance, humor, pranks, relationships, and even hotel business. It has been a major goal of mine to balance the different features so as to create a coherent package with a wide appeal, from the aviation enthusiast to the reader who expects deft handling of relationships.